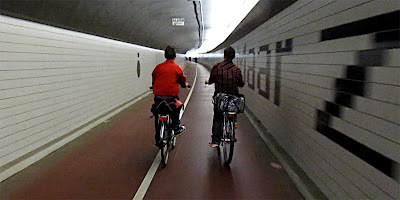 Benelux cycling tunnel is a 2002 cycling tunnel under the Nieuwe Maas (New Meuse). 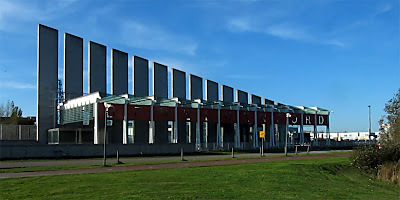 It is a connection between the municipalities of Vlaardingen and Schiedam to the Rotterdam suburbs of Pernis and Hoogvliet and the town of Spijkenisse. The large area of petrochemical industry in the port area of Rotterdam is also easily reached through this tunnel. 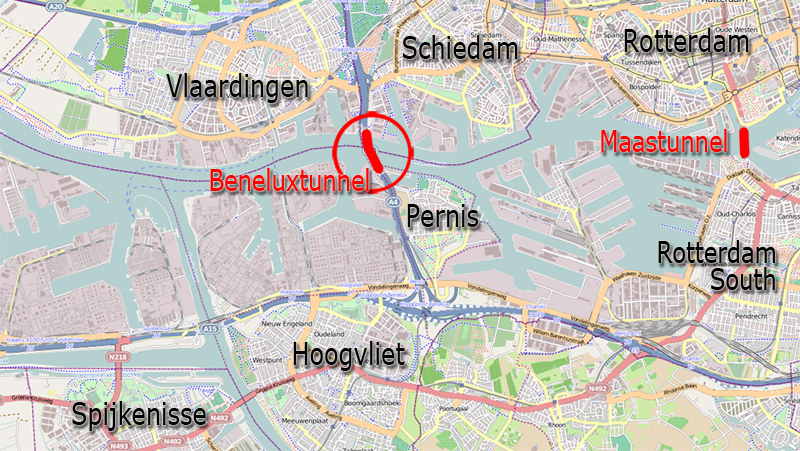 Benelux Tunnel is one of the few crossing possibilities of the New Meuse in the Rotterdam Port area. 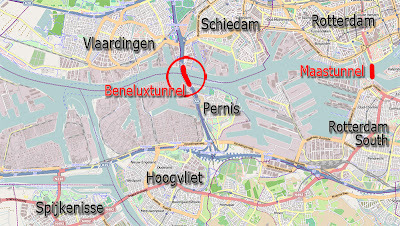 The original Beneluxtunnel was a tunnel for motorised traffic only, that was completed in 1967. 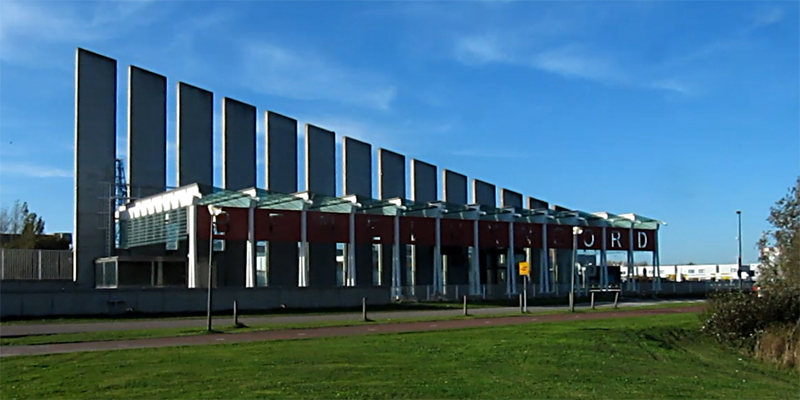 It was built to the west of Rotterdam to relieve the older Maastunnel in the centre. Cyclists kept their ferry from Vlaardingen to the area of the petrochemical industry to the south of the river. The Royal Dutch Shell oil refinery near Pernis is the largest refinery in Europe and one of the largest in the world. With the expansion the old tunnel really became a system of different tunnel tubes for motorised traffic, a metro-line and one tube for cyclists and pedestrians. There was no room for an elaborate entrance building, in fact the entrance could only have the width of the cycling tunnel tube itself. So the escalators and the elevators were not placed next to each other but behind each other in line with the tunnel. To make the entrance stand out in the enormous scale of the port area it has concrete columns which are a lot higher than necessary. So cyclists can use it as a point of orientation. The entrance is kept open on three sides to make sure people do not use it for other purposes. The roof is made of glass so a lot of light floods into the tunnel but it is still shielded from rain and snow. The glass plates span 4 meters, a larger span for horizontal glass than ever used before. A lot of attention was given to the inside of the tunnel as well. For a better atmosphere which enhances the feeling of social safety, the tunnel was finished with high quality materials. The curved ceiling is lighted from below. A mirror of polished steel on one side gives the impression the tunnel is twice as wide as it really is. A poem was integrated in the tiles of the tunnel walls. This gives cyclists and pedestrians not only some ‘entertainment’ while using the tunnel it also gives them a sense of how far in the tunnel they are. Inside Benelux Cycling Tunnel. To the right a fragment of the poem. And of course: my blog post wouldn't be complete without a video. Are these escalators build with a less steep angle than those for pedestrians? I found it interesting to see more cyclists use the escalators than the elevators. Unfortuneately I don't know of any dedicated bike escalator in Berlin. Of course there are many in the stations for public transport and most cyclists use them despite the signs that tell them, that this is not allowed. In fact, I do the same and find them much quicker and more convenient than elevators. They are said to be more expensive and thus the public transport companies are trying to replace them with elevators whenever possible. I love dedicated cycle tunnels and bridges. I'm not sure what it is about them, maybe the recognition of cycling as a viable means of transport worth some investment. The quality of this one looks brilliant and with a fair bit of traffic too. The UK used to invest in cycle infrastructure. It's true! I don't mean the terrible bits of paint alongside the gutter but actual dedicated cycle tunnels and the like. Of course this was before the rise and rise of the car as means of personal transport everywhere and for everything! This is a post and video I did about the Tyne Cycle Tunnel up at Newcastle. As you can see it's a little older and does not get nearly as much use! Looks like the only dedicated cycle infrastructure we can look forward to in the UK in the near future are reclaimed railway lines as part of the 'National Cycle Network'. Not really a useful network for anything more than leisure for the majority of people. Got get me a holiday to the Netherlands to see what I'm really missing. Hi, really interesting article, love your blog on cycling. Inspiration for us in the UK. @Michael S. these escalators are in no way different from any other escalators. They are not less steep. It is perfectly possible to take a bike on escalators (provided they are wide enough). Most of the children here forgot to turn the front wheel. If you do that it is much easier to hold the bike as it stays in place due to balance and gravity. Can we please have one of those tunnels for an all-year crossing of the St. Lawrence in Montreal? Re Escalators: I never understood why one would ban bikes from them. They're much more convenient than elevators in most cases and easy to use, either using the technique suggested by Mark or by just pulling the brakes. Here in Vancouver, BC, bikes aren't allowed on escalators but you are allowed to carry them down the stairs. The elevators are a good size but they're very slow. I suspect that's intentional so that only the "needy" use them. A tunnel like this would be great under the Fraser River to Tssawwassen. The present tunnel doesn't allow anything other than motor vehicles. I hope that whenever time in the future that it gets replaced that cycling and pedestrian crossing is included. The poem is really neat. Dutch is so similar to both English and German that I find it not that hard to figure out. I have used that tunnel several times, the elevator is *JUST* big enough for a Quest as if it was made for it, not sure if it would be a good idea to take a Quest on the escalator. On one trip though I had a Quest with a trailer which was somewhat more arkward as I had to unhitch the trailer and send it down sepratly, I was with a mate who took it out at the bottom and then I went down in the Quest. Are pedestrians supposed to go in there too or did you mean one tube each for bicyclists and pedestrians? @Alex, no in this tunnel it is not like Maastunnel where pedestrians do have their own tunneltube. Here the tube is shared cycling/pedestrians. But since this tunnel really has no destinations that can be reached on foot at either end, there are almost no pedestrians. It is all too long, too far for them as you can see in the second video of this post that shows a ride through the tunnel and also shows the empty surroundings at either end of the tunnel. The Tyne tunnels have one pedestrian and one cycle tunnel although both are two way. Den Bosch becomes Netherlands' "Fietsstad 2011"